The 10th Convocation was held on 1st June 2018 where 32 students were graduated from B. Th., M.Div.,M. Div Extension and M.Th. Extension. Rev. Dr. Visielie Angami, Principal, FTS gave away the Degrees and Awards to the graduating students. Rev. Dr. Zelhou Keyho, General Secretary, Nagaland Baptist Church Council (NBCC) was the Guest Speaker of the Convocation Programme. A music workshop was held in August 2017 where Music lessons on conducting and voice were given. Also, beautiful choral pieces were taught by FTS Guest Faculty & Music Teacher Maker Maks Kashung. It is always delightful to have him as one of the most influential music teacher and expecting to have him soon for another session. 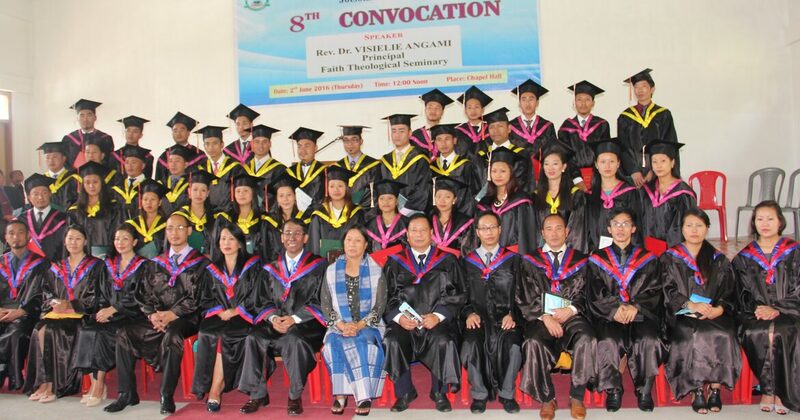 Faith Theological Seminary, Jotsoma, Kohima had a splendid ceremony on its 9th Convocation on 2nd June, 2017 where altogether Twenty Five (25) students were graduated. Greetings was brought by Mr. Zapra Chakhesang, Chairman Board of Directors. Rev. Dr. Visielie Angami, Principal gave away the certificate to the graduates and the award was given away by Mr. Zapra Chakhesang. The valedictory message was delivered by Miss Asola Jamir, Academic Dean. The speaker in her message exhorted the graduates to willingly obey God and Trust in Him because God uses ordinary people for extra-ordinary things. The service was led by Mr Kholi Salew Registrar. The Academic Excellence Award was received by Miss Keneihenuo Semou of M. Div and Mr. Keneiphrelie of B. Th., the Best Thesis award was received by Miss Rebeca Yimchunger of M. Div. The programme was culminated by a commissioning prayer led by the Principal. The 8th Convocation was held on 2nd June 2016 where Thirty Three (33) of the students were graduated from B. Th, M.Div. M. Min & M. Div Extension. The FTS family acknowledges God’s grace and providence to be able to train such talented and enthusiastic young men and women for His field.